Desperation is the mother of creativity, or so the saying goes. Add to desperation a healthy dose of a desire to do big things, things that require money, and I was in a tight spot. It was a Wednesday, and I was coming to the realization I had bills to pay, and I wasn’t going to be able to pay them on time. I could blame my accountant–he hadn’t been sending me the weekly updates I had requested to tell me how much money I had available to spend, but as Jack Canfield, author of Chicken Soup for the Soul says, there’s power in taking responsibility for everything that happens to you in life. The problem was that taking responsibility meant coming up with several thousand dollars–quick. If I didn’t, several people were going to get their paychecks late. Also, I was planning a live event in Utah, and I needed to put up a down payment of $5,000 to reserve the hotel venue. And I had to pay for myself to get there and back from China, where I live. Oh, and then there’s the membership to an exclusive group I wanted to join, a mere $25,000, which seemed like a completely unattainable dream given all the other expenses I had on my plate. Plus, who pays $25K to join some group? Sheesh! Except my friend had just joined, the guy who had just landed a $220,000 book deal advance…so maybe I should take a closer look. Alright, folks. Let’s get serious (in a fun way). Several years ago I took a self-help class and it changed my life. I wouldn’t be here today without it. A core part of that course was “stretches.” These were exercises designed to prove to us that we are capable of much, much more than we think we are. We couldn’t refuse the “stretch” or they would give us a harder, more embarrassing one. We had one guy who pushed back and refused five stretches and ended up throwing a party for all his Harley biker and ex-con friends in his backyard…while he was dressed like Ms. Doubtfire, and he wasn’t allowed to explain to them why he was dressed up that way. Over a three month period I was involved in 20-30 of these types of stretch exercises, plus lots of smaller ones with various objectives (like standing in front of a grocery store dressed like Superman and offering to help people get their groceries into their cars–I think that one was supposed to teach me something about serving even when it’s not comfortable). By the time the course was done I could never again use the excuse “Well, that’s just not possible.” I had seen that kind of thinking blown to bits too many times as average people did incredible things. With my connections we can get articles published immediately in Forbes, Inc., HuffPo, etc. about pretty much anything we want. A Stripe account for processing credit cards. A video guy here in China who can film whatever needs to be filmed and edit it quickly. You guys can write stuff. The Influencer Inc FB group (but we can’t spam it). High quality audio recording equipment. 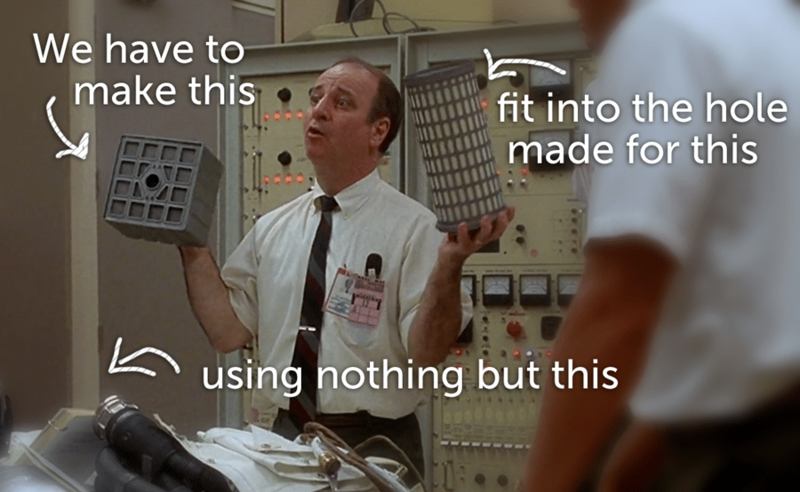 This is kind of like Apollo 13, right? Except if we don’t succeed nobody dies, and I think our assets are considerably better for the task before us than what those astronauts had available to accomplish their’s…theirs’….theirs? Ah, whatever. Land a big coaching client. Are there any I’m missing? Of those, if I had to choose just one, I think pre-selling a course is the most viable path because it’s the least work and involves selling something that isn’t a huge-ticket item, but is big enough that if we sell it 5-10 times (depending on how we price it) then we reach the goal. Launch a big coaching client or two is possible, but probably not without a bunch of phone calls and working the deal. Still, it might be worth getting an article out that promotes me as a coach, because it’s pretty quick and easy work to get an article done. If we did this, I prefer the kind of article that doesn’t seek to convince anyone they need coaching, but catches the person who is already looking for coaching and is just trying to figure out who to work with. And that person is going to go presell a course and make $30K this weekend. If that person can do it, what’s holding us back from doing it? Ok, kidding aside, can we make this happen? Do you guys believe we can make it happen? If so, what would need to happen today, tomorrow, and the next day to make this happen? I’ve seen normal people do the impossible, but we’re not normal, we’re awesome. What can we make happen? I love it. David is asleep and we’re camping, but I for one think this is an amazing idea and I’m excited to see what craziness is about to ensue. It would be days later I would find out they cut their camping trip short and canceled their trip to see the full solar eclipse to take on my challenge, while also in the middle of a move, and with spotty internet. I love my team! Now I need to bring in even more cash so I can send them on the camping trip of their dreams as thanks for what they pulled off. 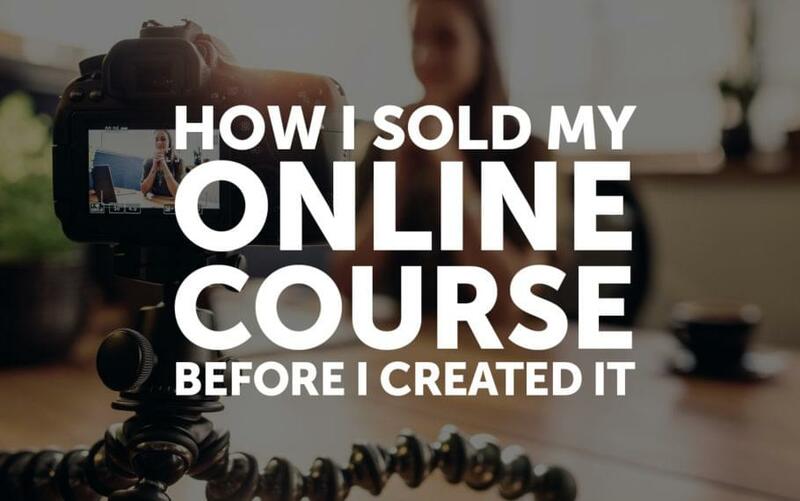 The great thing about pre-selling a course, of course, is that you don’t need to create the course, you just need the idea, and an audience willing to bet that you can pull it off. David’s first idea was to send a survey to my email list of roughly 2,500 subscribers to gather information and find out what they would be most interested in. He created the survey in TypeForm and sent it to my entire email list. I was seriously afraid we would get 10 responses, and they would all be from my friends who would just be trying to be helpful but wouldn’t be about to buy anything from me. Instead, I was pleasantly surprised when we received 121 responses. However, by the point when we received this data this had taken us all the way until Friday, what with communication between the east coast of the US and China, and the back and forth of working on content together. If we were going to get $30K in sales by Saturday evening, we had precious little time to actually send something out that people could respond to and buy. Message: Hi [FIRST NAME GOES HERE]! I usually don’t send emails out on weekends, but I always give preference to those who help me and if I didn’t send this email today then you might miss out on what I’m going to release Monday morning. I got a much larger response than expected to the survey I sent out in the last email, which was the last step towards deciding what my first-ever online course will be. As a result, I will host a 6 week beta course to take the mystery out of becoming a contributor to Forbes and other top publications. Since you helped me with your survey responses I thought it was only fair that I reach out immediately and let you know about it before I announce this everywhere on Monday. Not only will you learn through my course how to become a contributor to top publications, but I’m giving you a money-back guarantee–you or your company will get one guaranteed placement in a top publication or I’ll give you a full refund, no questions asked. But I’m not going to just hand this placement to you, I’m going to walk you through it step-by-step so you can see exactly how I do it. …so you can do this all yourself, at will, forever. Within a private online group, I’ll give you one-on-one feedback on the angle you should use for your contributor pitch, down to the individual words, to identify exactly what needs to change to make your pitch a success, removing all the guesswork, and you’ll learn from others as I critique their pitches, too. Now for the caveats: First, I’ll need to review your situation before I o.k. you to join the class–I will accept absolutely no money unless I’m confident you can succeed. You’ll get a big price reduction (the completed version of this course will be $6,000, but the beta will be 50% off). I’ll never offer this price again (my marketing agency charges clients $5K-$7.5K for a single article placement). To put this in perspective, I became a contributor to Forbes in early 2013, and I then leveraged my experience at Forbes to get my writing published in Fortune, Business Insider, Entrepreneur, Inc., Mashable, TechCrunch, and a dozen others. I can track my writing to over $3 million in revenue for my agency, and I know many others who are building their businesses and their careers the same way I did. Or think of it this way: if a well-placed article in Forbes or another top-tier business publication (which, remember, I am guaranteeing or your money back) brought you just one additional client, boosted the price you could charge for your goods or services, or helped you get snapped up in a competitive job market–what would it be worth? And if being able to place dozens, or hundreds of those articles does for your career even a small fraction of what it’s done for mine… well, how’s that for a positive ROI on your $2,500 investment? Class starts Monday evening, September 4th, with a private webinar that includes me, you, and just 14 other class members where you’ll have the chance to ask me anything you want, and from there it’s a 6-week countdown to a top-tier publication. If you feel this is the right fit to take your personal or business brand to the next level, shoot me an email to reserve your spot–I’ll review your situation and let you know if it’s a match! Thanks again for your survey responses and being part of this. I’m excited to help you launch this next phase of your career and see what you can do with this opportunity! P.S. I’ll still be reaching out to those of you who indicated in the survey results they’d like a follow up from me in a separate email in the next few days. Then the real nail-biting began. At this point it was already Saturday evening my time and I don’t work on Sundays, so I wasn’t really going to find out how things went until Monday morning, China time. That meant we wouldn’t be collecting $30K Saturday, but everyone had scrambled and done an amazing job, and the offer was out there. Achieving our goal a few days late wouldn’t be such a bad thing. Thank you for thinking of me when you thought about offering this out, but this isn’t for me I’m afraid. I’m not sure how your agency gets away with charging $5k per article! I guess prices must be a lot different in China than the UK! Ouch! That hurt (no hard feelings though, Mike, it’s all good!). I could see from subject lines there were other email responses waiting for me, but were they all going to be like this? If so, I was doomed. Not only would I not get the money I needed, I certainly wouldn’t be getting the money for the extra things, there would be a cascade effect, and who knew how bad the fallout would be. Would I have to cancel the live even in November? Would I have to let people go whom I had just hired? Would I have to tell my wife I had failed, yet again? Ugh. I’m interested in taking the course with your special pricing. I am the founder and CEO of an agency which helps established consumer product brands to manage their Amazon accounts and grow revenue on that platform. We have had a lot of success with content marketing so far (company blog + soon to launch a podcast) but I’m also interested in the credibility and exposure that being published in major business publications would provide. Yes! This was encouraging. I reached out and spoke with this founder, made sure she was set up to succeed, and got her invoiced and paid up. Then there was an executive from IBM who signed up, then the SEO firm owner. Then another SEO firm owner. Then the publisher of an investment letter, and so on. We also sent out an email to my whole email list, including those who hadn’t filled out the survey. By the time the initial dust settled we had over $15,000 in sales, and inquiries and commitments still coming in. At this point I hadn’t posted anything on my social media profiles, had done no advertising, had engaged in zero PR, and hadn’t even told my Facebook group of 3,200 influencers about the opportunity. We were a few days late, but now it looked like we might indeed sell out and not bring in just $30K, but something closer to $60K. That became the new goal. Note: After the first few submissions via email, I realized I needed a form. I had received a few applications from people who hadn’t read all the details on the course sales page and didn’t realize it wasn’t free, or that it cost more than $50, so the form included a checkbox instructing those who submitted an application to check the box stating that they understood how much it cost. After selling that initial $15,000 or so, then things slowed down. We had used up our initial goodwill, it appeared. Now what? I had told everyone I was going to cap the enrollment at 20 spots, and if I only sold 5…ugh. We had to get creative and figure out how to market this thing. That’s when we stumbled onto a goldmine. Over the years I’ve accepted a lot of connection requests on LinkedIn, and I’ve also reached out to a lot of people, and I had built up almost 15,000 connections on the social network. Then, as fate would have it (not that I believe in such things), I happened to interview AJ Wilcox of B2Linked for Influence Summit 2017, and being the LinkedIn expert he is, he happened to inform me of the little known fact that you can export all the data on your connections to a spreadsheet, including their email addresses. Hi [name], I’ve been pretty liberal about who I accept connections from on LinkedIn and as a result I now have over 14,000 connections, and the limit is 15,000 [turns out I was wrong about this, it’s actually 30,000]. It was never really my intent to focus on quantity, but now I am making a real effort to focus on quality, and in the spirit of Adam Grant’s awesome book Give and Take, I want to do a little giving, and the only thing I’m going to take is 30 seconds of your time to read the rest of my email below. My Give – I’m giving free PR advice. Ask me anything. I’ve published over 300 articles in places like Time, Fortune, Forbes, Mashable, and TechCrunch. I also run a marketing agency, so I do a fair amount of pitching for myself and my clients. I know what it’s like on both sides. Want to know how to get yourself or your company in the big business pubs? Seriously, ask me anything. My Ask – I became a contributor to Forbes in 2013, and leveraging that opportunity to build my personal brand has generated over $5 million in revenue for my agency, a book deal, and speaking engagements around the world. Then people started asking me if I could train them on how to get into Forbes and do the same thing. On September 4th I’ll launch my first online course focused on this topic. This masterclass is limited to 20 participants, and it’s already filling up. If writing for Forbes is something you’re interested in, you can learn more about my class here. That’s my whole ask, thanks for listening! As for this email, don’t worry, I haven’t added you to any sort of subscription. If you would like me to keep you updated on the amazing resources (mine and others’) for building a personal brand, subscribe here to my newsletter. When you send an email to 14,000+ people you’re going to get some sort of response. I got an angry email or two demanding that I remove them from “my list,” even though I made it clear this wasn’t any sort of subscription, it was a one-time email. One person threatened to sue me. But we did get more signups. Hi [name], it sounds like we’ve got a great match! If this new step in your life does half for you what it has done for me it’s going to be a wonderful adventure. This masterclass is filling up fast! There’s just one step left to secure your spot which is payment. I’ve sent you an invoice for the course, which will officially start the evening of September 4th. I’ll provide more details as the date gets closer, and I’ll also add you to the private Facebook group shortly. In the meantime, I hope you enjoy reading, because I’ve got some great books for you to read. Please get these and read as much of them as possible before the beginning of the course. If you read through these and want more, let me know, I’ve got a long list. Also, please tell me what your biggest question is about becoming a contributor to top publications like Forbes so I can make sure I answer it well when the masterclass begins. Good news and bad news. The good news is I had someone on my spreadsheet twice, so I actually have one more spot in the masterclass than I thought I had. The bad news is that more people now want in. 17 spots have been claimed and paid for. There are 3 spots left. There are nine of you who are receiving this email, and who have received invoices. Whichever three of you pay your invoice first get in. The rest will have to wait for the next round when the price doubles to $6,000. If you haven’t seen the invoice check your spam folder, or let me know to resend it. The masterclass starts Monday evening, US time. You don’t have to attend the opening webinar live, it will be recorded and you won’t miss a thing if you’re in a timezone that’s not convenient. The main activity will take place in the Facebook group which is up and running and already getting active. Hi everyone, two more people paid their invoices this weekend, so that leaves just one spot open in the Forbes contributor masterclass/course, and there are 8 of you holding invoices. Whoever of the 8 of you pays first gets in. If you prefer to wait for the next class that’s fine by me, but the rate will double from $3,000 to $6,000. We’re already starting to see conversations happening in the private Facebook group, and our kickoff webinar starts in just under 24 hours. Hope to see you there! The next class will launch October 23rd, and the pricing will be $6,000, but I know some of you really, really wanted to get into this first beta class with the promotional pricing so I’m going to meet you halfway and make you a special offer that I’m not giving to anyone but this group–if you prepay in full for the next masterclass by end of day this Friday, the 8th, then I’ll give it to you for just $4,000. I’ve updated the invoices I’ve already sent you to reflect this change and will be resending those shortly. After Friday I’ll delete any invoices not already paid. I’m thrilled at the response to this first round and that we sold out the course, but I’m sorry you couldn’t make it into this round. I hope to see you in the next one! Boom! We did it! We sold out the 20 slots, and had others who would have paid if we had opened the class for one or two more slots. I could hardly believe it. I still can’t really believe it. What had seemed almost impossible had happened. The masterclass got under way and within a few days people were submitting applications. Are you ready to sign up for the next cohort? Check out my page with all the details and the application link here.